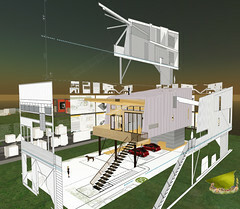 The Porchdog project (link) we built on Architecture Island for Cameron Sinclair’s debut appearance in Second Life just showed up in Wired (link to article). Original machinima HERE. Machinima showing Cameron Sinclair and John Gage discussing virtual collaboration and Open Architecture Network in Second Life. Sponsored by Sun Professional Services, coordinated by Clear Ink, machinima by Kiwini Oe. Cameron Sinclair, 2006 TED Prize winner, Executive Director of Architecture for Humanity, co-editor of the book ‘Design Like You Give A Damn‘ and contributing writer for Worldchanging.com will be joined by Sun Microsystems founder John Gage in a live audio discussion in Second Life. 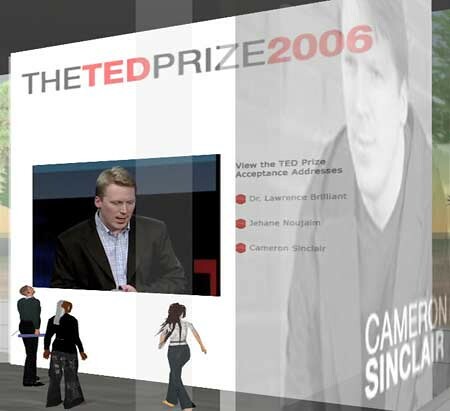 They will discuss collaboration and participation in 3D environments, as well as the newly launched ‘Open Architecture Network‘ – which represents the fulfillment of Cameron’s 2006 TED wish. The event will feature a virtual version of the ‘Porchdog‘ and the Global Village Shelters – both of which are contributions to the Open Architecture Network. The event will be held on Clear Ink‘s Allston sim HERE (SLurl) on Tuesday, April 24th at 10:00 am PST (SL-time). 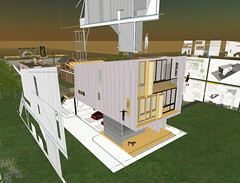 Installations and live audio stream will also be available at the University Project sim (SLurl), and the live audio can also be heard on Clear Ink Island (SLurl). Sponsored by Sun Professional Services, coordinated by Clear Ink.